The professor of astronomy, meteorology and mathematics and Marquis of the Holy Roman Empire Giovanni Poleni (1683-1761) (see biography of Poleni) was one of the famous European scientists of the beginning of the 18th century. 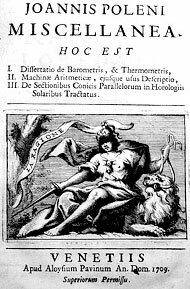 In 1709 the young professor published his first book—Miscellanea, a small collection of dissertations on physics (it was a sort of doctoral thesis to obtain the University appointment). Miscellanea includes dissertations on barometers, thermometers, and conical sections in sundials, as well as an illustrated treatise describing his arithmetical calculating machine, which proved to be the first calculating machine with gears with a variable number of teeth (so called pin-wheel). "Having heard several times, either from the voice, or from the writings of scientists, which were made by the insight and the care of the most illustrious Pascal and Leibniz, two machines which are used for arithmetic multiplication, which I do not know the description of the mechanism, and I do not know if it was made manifest, I wanted and guess with thought and reflection to their construction, to build a new one that implement the same purpose." Then Poleni continues: "By a happy chance, I designed a machine with the use of which even a novice in the art of calculation, provided that knows the figures, can perform arithmetic operations with his own hand. So I am worried that it was made of wood, as I had planned and that, although initially built with poor precision, showed that this was achievable, rather than made. Therefore, I have recreated the machine from scratch, building it of the hardest wood, with all possible attention and the work done has not failed in vain." So, according to the inventor himself, two wooden copies of the machine were made, but unfortunately none of them survived to the present time. In the image bellow is a replica of the machine from 1959. 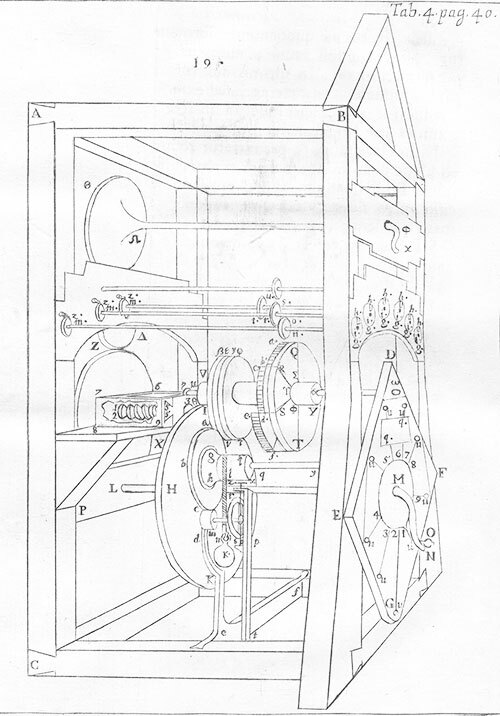 A description of the Poleni's machine appeared in 1727 in the Leupold's Theatrum arithmetico geometricum and in "Versuch einer Geschichte der Rechenmaschine" by Johann Bischoff, 1804. 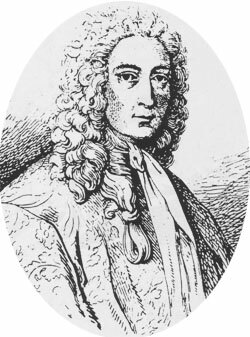 The first biographer of Poleni, the Frenchman Jean de Fouchy Pajil Grandjean, claims in his 1762 book "Eloge de Jean POLENI, Marquis du St. Empire, (né 1683 mort 1761)", that "...having heard that Mr Brawn, a famous mechanic in Vienna, presented a similar machine to the Emperor, Poleni destroyed his machine and no more wanted to rebuild it." The same story is repeated in the two later Poleni's biographies—Cossali, (1813) and Gennari (1839). Despite of the fact, that Fouchy was in strict contact with Poleni (when alive) and knew him personally, this story is quite questionable, not only because it is not compatible with the gentle character of Poleni. Fouchy obviously mentioned the German mechanic, constructor and optician Anton Braun, who worked in Vienna for the court and really presented his calculating machine (based on the pin-wheels of Poleni and Leibniz) with great success to the Emperor, but this happened as late as in 1727. It is quite possible Anton Braun to had read Miscellanea, and to decided to use the idea of Poleni in his construction, the history of inventions is full of cases like that. But if Poleni didn't manage almost 20 years to manufacture and demonstrate a working copy of his machine, obviously he was not interested in this device at all and fully deserved to be outrun by others. 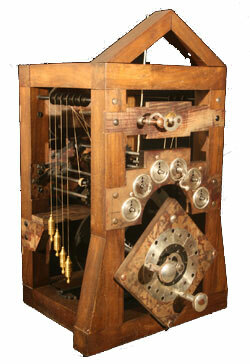 The machine of Poleni was quite big (with the dimensions of a big clock with pendulum). Let's examine its mechanism, looking at the illustration from the Theatrum arithmetico geometricum. 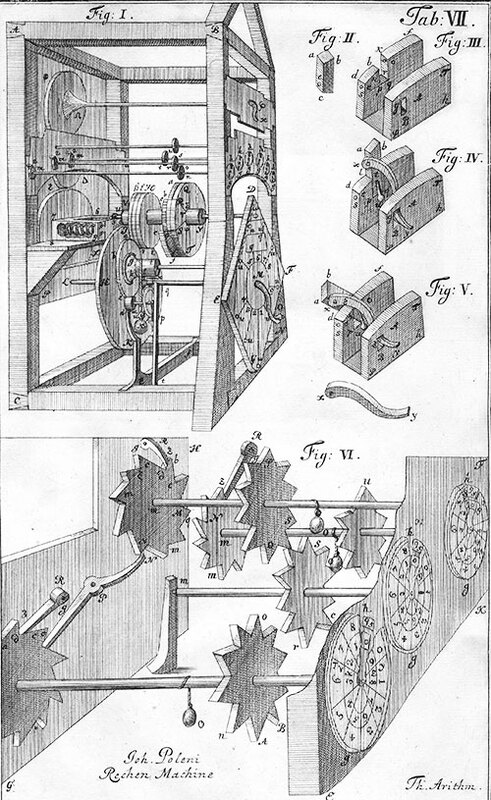 The mechanism is set in motion by means of the weight K, tied to the end of the rope l, which is winded over the cylinder t. The most important element of the machine—so called pin-wheel, invented probably (it is known that Leibniz has a similar design in one of his manuscripts, and that Leibniz and Poleni had a correspondence) by Poleni, is placed to the right of the axis VY. Actually in the machine are placed 3 pin-wheels, which means, that the input mechanism has only 3 digital positions. The pin-wheel of Poleni actually is a smooth wheel, with attached to it a sector with 9 blocks, illustrated in the right part of the figure. Each blocks contains a body (marked with 3 in the figure), a tooth (marked with 2), and a small rod (marked with 4). There is also a forth element of the block—a small spring, which is not shown in the figure. In the assembled block (marked with 1), the tooth can be erected outside of the block, if the rod is pressed by the operator or hidden in the body of the block, if the rod is released. Thus in the each one of three sectors with blocks can be set from 0 to 9 erected teeth. When the tooth is erected, it will engage with the calculating mechanism during the revolution of the calculating mechanism, otherwise—not. An additional crank was used for shifting the pin-wheel mechanism by one place at a time with respect to the transfer tooth wheels, thus allowing the multiplicand to be multiplied by the multiplier in higher places. 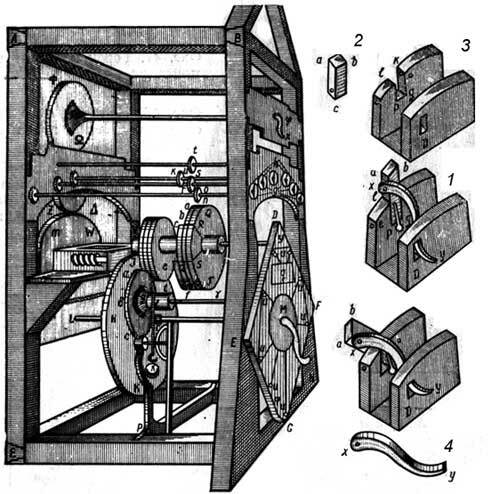 As a whole, despite the innovative idea of Poleni for the pin-wheel, which will become extremely popular constructive element of the calculating machines some 150 years later on (see the machines of Baldwin and Odhner), his machine looks rather rough and ill-formed device, as compared to the machine of his successor—Anton Braun.